The weekend is almost here! I’m so happy for you, my readers – your R&R time is just hours away! And have I got a healthy, nutritious, but oh-so-tasty meal idea for you and your family! Sounds fishy to you? You bet! 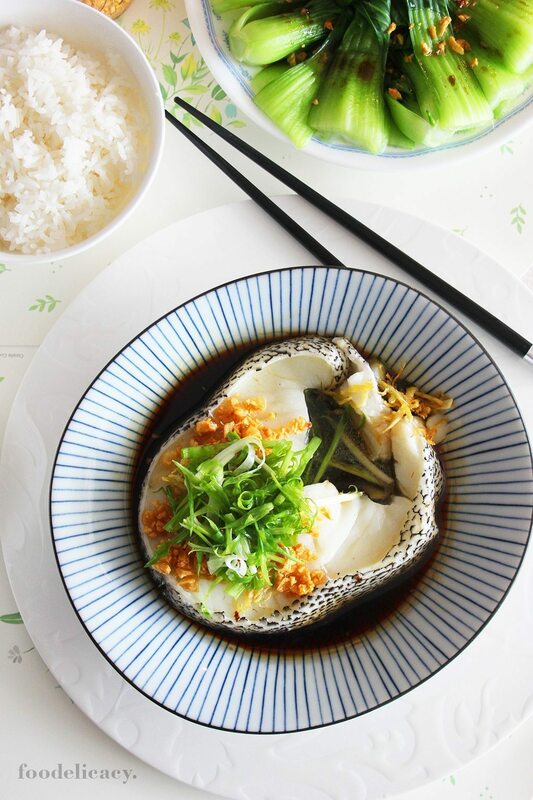 If you’re heading to your grocer or wet market this weekend, get a fresh fillet of cod (or your favourite white-fleshed fish like red snapper, garoupa, etc) and prepare this classic Cantonese-style favourite, steamed cod with special soy sauce. This is a restaurant-styled version, with a home-cooked soy sauce dressing, and lavish garnishings of crispy fried garlic nibs, fragrant ginger strips, and generous slivers of spring onion, and (this is what I think is such an essential contributor to this dish’s overall flavour) drizzled with heart-healthy garlic-ginger flavoured oil. 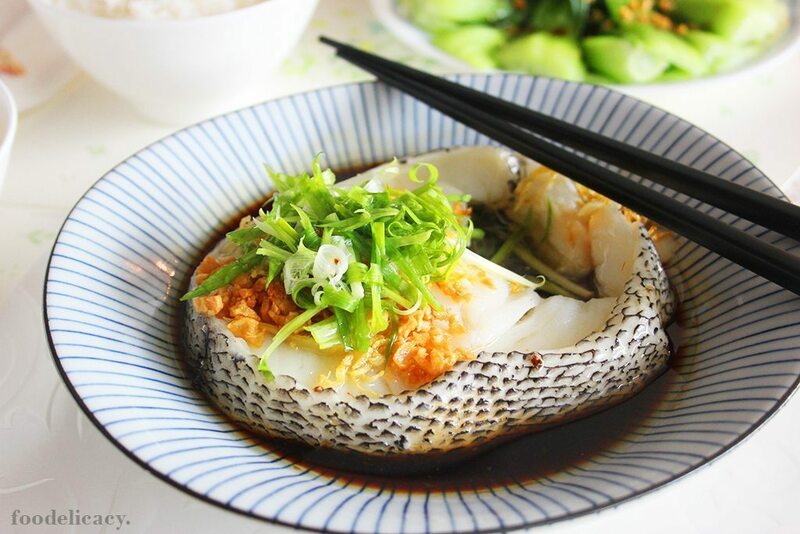 Cod is one of my favourite options for a steamed fish dish. The mildly creamy and sweet-tasting flesh makes it an incredibly versatile fish for various cooking methods and combinations of condiments. Cod is delicious pan-fried, baked, or steamed. Though given the steep prices of fresh cod these days (like everything else! ), anywhere in the upwards of $50 per kilo, I prefer to cook by steaming, to allow the full flavours of the cod to come through. 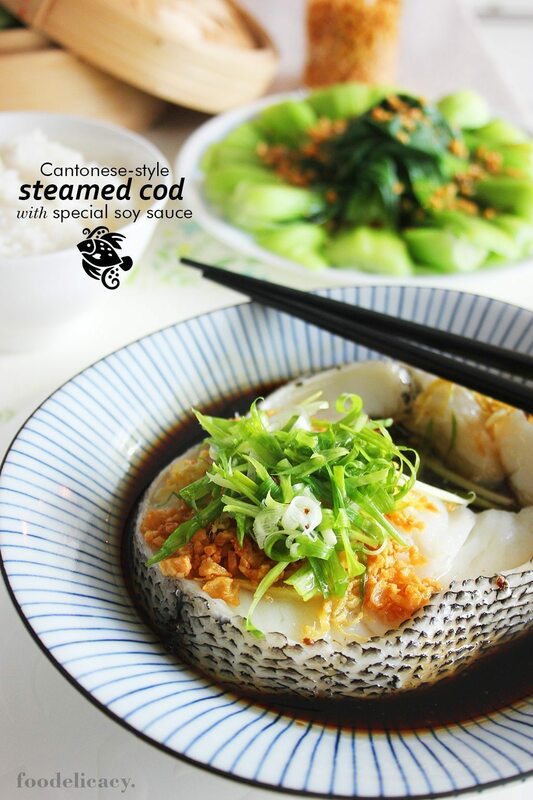 You don’t need to burn a hole in your purse by buying cod at these prices, and there are other equally good choices of fish you can prepare with this Cantonese-style soy sauce dressing, the better options being white-fleshed fish with neutral to mild flavours. Just as important as the choice of fish when it comes to preparing steamed fish, I truly feel that the sauce (dressing) either makes or breaks the dish! I think we’ve all had that moment when we’ve been served restaurant-prepared Cantonese-style steamed fish with soy sauce, and thought, “Man, if only I could make a sauce that delicious!”. Well, it took me a while to experiment with different recipes, and this one, by far, does it for me! This home-cooked soy sauce dressing is incredibly easy to make, and makes enough for at least 3 to 4 full servings (i.e. one serving = a whole fish), and if kept in an air-tight container and handled well with each use, will keep well for a week, or slightly longer, in the refrigerator. I also make it a point to use a heart-healthy oil like grapeseed oil for preparing the garlic-ginger flavoured oil – I figured that if I was going to drizzle some of this over my steamed fish, it might as well be one that’s actually healthier! Use any heart-healthy but neutral-tasting oil of your choice. Finally, don’t forget to tell me if you try this and how it turns out! I’d love to hear all about it! Sharing is caring! Remove scales and rub some salt (about 1 tsp) all over the fish and rinse with water. Pat dry with paper towel. Now rub cornstarch all over, and place into a heat-proof steaming dish. Cover with cling wrap and set aside. Wash Chinese coriander, and cut a 4-cm (2-inch) length from the stalk end, keeping the roots. In a small saucepan set over medium heat, bring water to a boil. Add coriander head and roots, and boil for about 15 minutes. Discard coriander, add rock sugar and continue to simmer until rock sugar dissolves. Add light soy sauce, dark soy sauce, and chicken stock granules (powder), and stir to combine well. Taste (it should be just slightly salty with a hint of sweetness). Add more sugar if too salty, or more water if sauce thickens. Bring back to boil for a minute, then turn off heat, and set aside. In a small saucepan, heat up oil over medium heat. When oil is just hot, put in chopped garlic. Keep stirring to fry evenly, until garlic just starts to turn golden brown (do not over-cook, otherwise the garlic will become bitter-tasting) . At this point, immediately sieve out the garlic and drain on paper towel, leaving oil in the saucepan. Now put in the sliced ginger strips, and stir-fry in the oil until it turns golden brown at the edges. Sieve out from the oil, leaving the oil in the saucepan for later. Prepare the steamer. When water comes to a rapid boil, steam fish over high heat for 12 to 15 minutes (depending on the size of your fish). Test for doneness with a fork. If the flesh easily flakes off, fish is done. Meanwhile, shred spring onion, and soak in water until it curls up (about 1 - 2 minutes). Drain and set aside. When fish is done, drain the juices from the dish. Place fried garlic, ginger strips and shredded spring onion on top. Heat the garlic-ginger oil in the saucepan until very hot. Drizzle 2 - 3 tbsp of oil over the fish, followed by 2 - 3 tbsp (or to taste) of special soy sauce. Serve immediately.